Our mobile storage units are a wooden crate the size of a small shed on wheels (HxWxD: 7ft x 5ft2in x 7ft2in). 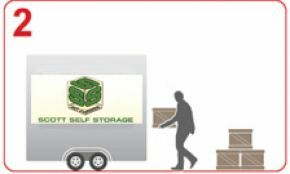 The best bit: we bring as many storage units as you need to your premises for you to load. Then we collect them and safely store them in our secure storage centre. 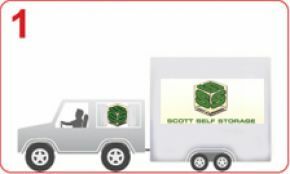 ONE: We phone you to confirm the drop off time, and then deliver the storage unit (a shed on wheels) in our secure trailer to your door. We leave the trailer with the unit inside for loading. We supply as many units as you need. TWO: You load the storage unit's. Packing materials available from our Box Shop. 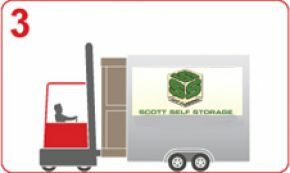 With prior arrangement, we can help you load to get best use of the space. Your work is finished! THREE: You call us. 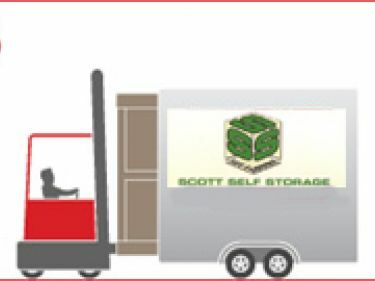 We collect your loaded unit and place it in our secure storage centre. There is no charge to access your unit whilst in store, but we will need some notice. We return your unit when you've finished storing. If you don’t need instant access to all of your stored items, we are confident that we can save you time and money. With a combined solution of mobile storage crates together with a small self storage room for those instant access items, you get the best of both worlds. Unfortunately we can’t deliver crates or give access to crates on weekends.